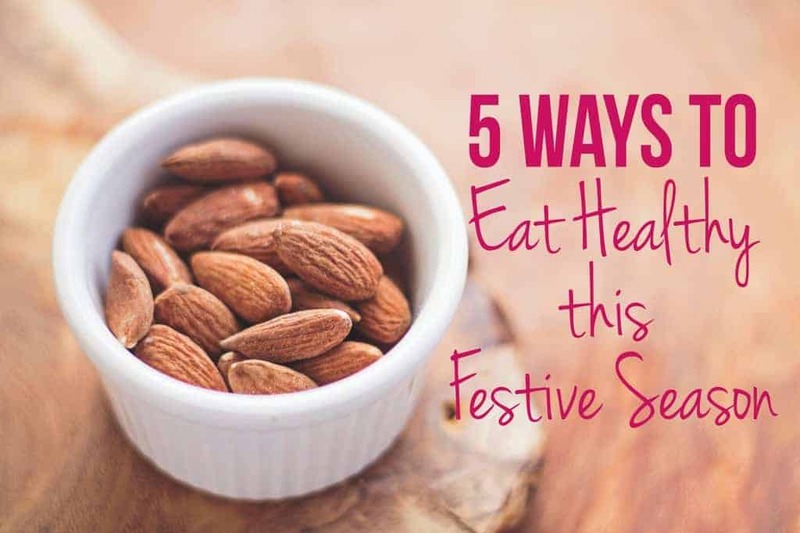 5 simple ways and tips to eat healthy this festive season with healthy festival recipe options to keep those calories at bay! Festivals bring with them a bucket-load of calories, and no matter how much I resist, it’s so tempting to reach for one more laddoo or one more barfi! Especially, when they are homemade with love 🙂 I’m not saying we should abandon all those ghee laden Indian desserts completely (because they are just THAT good), but these 5 simple ways to eat healthy this festive season will definitely make a huge difference in balancing it all out. Diwali is incomplete without desserts right, so why not look for healthier options instead? Use whole grains in your desserts such as Quinoa or Oats and substituteprocessed sugarwithhoney or jaggery. An important power that we have is that we can choose what we want to eat. So next time, you are accosted by an annoying Aunty who shoves a plate of heavy kaju katli in your face, reach for that platter of dry fruits and nuts instead. Tell her how much you love almonds and grab a handful of them before she can insist. Almonds are full of Vitamin E, copper, magnesium, and high quality protein and have good quality fats and will not leave you feeling heavy and bloated. Come festivals and we forget our resolve to eat salads and greens. This festive season, don’t forget to include a big Salad bowl for every meal. Salads don’t have to be that boring plate of sliced cucumbers and tomatoes, but can be easy, versatile and full of beautiful flavours. Your family and your stomach will thank you if you start every meal with a salad and then fill up your plate with the rest. Festivals mean parties, get together and family gatherings. And lots of food to feed the hungry souls 🙂 We usually have at least one of these every festival and my mum cooks up a storm. This season, make way for some healthier appetizer and snack options and stay away from all the fried stuff, because healthy can be tasty too. Finally, learn to say no – politely. Remember, after all, whatever you eat is only going to affect you later. So next time someone offers you a plate of something loaded with calories, politely mention how you aren’t fond of that dessert or don’t eat sweets or fried food. They might make fun of you a bit and ask you if you are on a diet, but maybe the next time they’ll learn from you a little bit and say no themselves. Thanks Dolphia 🙂 In case you have any healthy desserts on your blog, let me know and I’ll love to link up to them! This is so good! Thanks for compiling the list Richa.